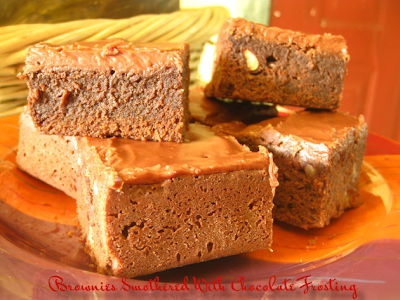 It's amazing how many variations and different types of brownies there are! All of them have their different tweaks: different baking pan sizes, different chocolates, different sugars, different nuts, different toppings. The featured frosting on the post prior to this one was made of semisweet chocolate and milk chocolate. The chocolate frosting in this post is made of bittersweet chocolate. The actual brownie batter of the prior post was made with unsweetened chocolate and bittersweet chocolate. The brownie batter in the Brownies Smothered With Chocolate Frosting recipe is made with unsweetened cocoa powder. No matter what makes up these brownies, they have all been coming out amazingly and really yummy. According to Brownies To Die For!, "Unsweetened cocoa powder stars in this chocolaty, frosty brownie! This is a very sweet brownie with a rich chocolate frosting that you simply must smother on (and, of course, lick your fingers after eating a square!)." 1) Heat oven to 350F. Lightly grease a 13x9" baking pan. 2) Melt the butter in a medium saucepan over low heat. Whisk in the cocoa until smooth; cool slightly. Stir the sugars into cocoa mixture until combined. Whisk in eggs, blending well. Whisk in the flour, vanilla, and salt until blended. Gently stir in pecan pieces. Spread into prepared pan. 3) Bake for 45 minutes or until a cake tester or toothpick inserted in the center comes out with a few moist crumbs attached. Cool pan completely on a wire rack. 1) Melt the chocolate and butter in a medium saucepan over low heat, stirring until smooth and blended. With an electric mixer, beat in sugar, milk, and vanilla on low speed to blend, then increase speed to medium high and beat until frosting is smooth and spreadable. 2) Frost cooled brownies. Cut into squares. ...and I could eat every version if they were put in front of me! These look very delicious and I am sure I could eat three or four, although I should not! Oh wow!!! I once ate 3 of them, then immediately went for a walk hehehehe They're so good, that I just can't stop!